Enhance Your Book Marketing Strategy! Congratulations! You have received a coveted Starred Review from BlueInk Review, allowing you to use this seal on your books. This is an invaluable marketing tool! 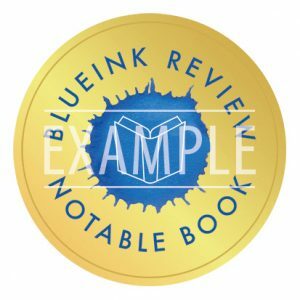 By adding the official BlueInk Notable Book Review seal to your book cover, you are letting the world know that your book has received high praise from one of the more respected independent book review companies. DIGITAL SEAL: This is a digital file usable by your printer when producing new books. One price guarantees unlimited use with the qualifying book title. FOIL SEALS: These beautifully designed gold foil seals come in sticker form for use on books that have already been printed. They are available in quantities of 100 and can be purchased at any time for use with the qualifying book title. Foil seals will be delivered to the address you supply at the time of checkout within 5-10 business days. Digital seal will be delivered to the email address attached to your account within 1-3 business days.